The New Mexico State University has a long history of chile pepper improvement. The chile pepper improvement program began in 1888 with Dr. Fabian Garcia. 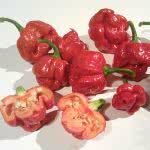 Nearly all pepper varieties from The Chile Pepper Institute bear the NuMex name. Read more about The Chile Pepper Institute here. 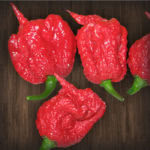 The NuMex Heritage 6-4 chile pepper was developed around 1998 from a seed bank of the original NuMex 6-4. The NuMex 6-4 was one of the earliest New Mexican type cultivars released and was prized for its rich flavor when it was originally released. The NuMex Heritage 6-4 has superior flavor compared with the currently grown standard green chile pepper.